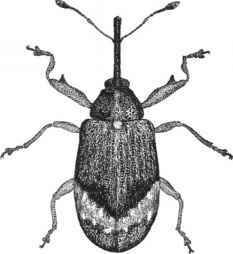 The apple blossom weevil is a potentially important pest; in addition to apple, minor attacks may also occur on medlar, pear and quince. Larvae feed within the shelter of unopened blossoms, the petals of which turn brown to produce the characteristic 'capped blossom'. Minor infestations are of little or no significance but when attacks are heavy, considerable crop losses may be expected and all but the most advanced blossoms on the tree may be destroyed. Adults feeding on buds or foliage have little deleterious effect, except on pear where attack buds can become distorted and may shrivel and die. Adult weevils emerge from hibernation in the early spring, usually from February onwards, to feed on the opening buds of apple trees. The weevils become sexually mature within a couple of weeks and mating then takes place. Soon afterwards, eggs are laid singly in the developing floral buds. The eggs hatch about 7-10 days later. Each larva feeds on the anthers and style, and also bites into the base of the petals to arrest their development. 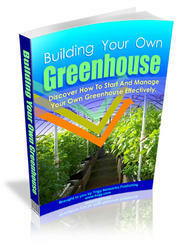 Larvae are fully grown in about a month. Each then pupates within the now empty shell of the capped blossom; the new adult emerges 2-3 weeks later, usually in June. Young adults feed on the foliage for a short time. They then seek suitable overwintering sites, under bark or leaf litter or in other sheltered situations such as piles of logs or fallen timber. Adult 3.5-6.0mm long, mainly black, with greyish and whitish hairs imparting a mottled pattern and a characteristic V-shaped mark over the elytra (Fig. 226). Egg 0.7 x 0.5mm, oval, white and translucent. Larva up to 8 mm long; body white to yellowish (Fig. 227a); head dark brown or blackish. 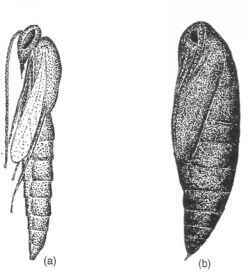 Pupa 4-5 mm long, pale yellow, with a pair of prominent posterior spines, and distinct wing pads and other appendages (Fig. 227b). Fig. 226 Apple blossom weevil, Anthonomus pomorum (x!5). Fig. 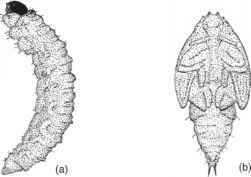 227 Immature stages of apple blossom weevil, Anthonomuspomorum: (a) larva; (b) pupa (xlO).